Followup on "Return of the Jedi"
We know from Episode I that Tattooine doesn't have much of a government. It was too remote to be of concern to the Old Republic, and the Empire didn't have much of a presence there until they were looking for some droids. The leadership they seem to have is some sort of guild-based oligarchy run by the Hutts. If that's the case, how responsible was it for Luke and his pals to assassinate Jabba and his entourage? I'm sure government by the Hutts wasn't always the best (they seemed partial to slavery and gambling), but it was surely better than total anarchy. Did the rebels just assume that democracy would flourish once they toppled a dictator? Did they expect to be treated as liberators? Why does this all sound so familiar? "Mon Mothma sends her regards." Was born in Stockholm, Sweden, in 1957. Holds a masters degree in chemistry from the University of Sydney. Was awarded aFulbright scholarship to study at MIT. Holds a 3rd degree black belt in karate. My friends Kyle and Di recommended this short film to me the other day. It just won the Academy Award for best short film, and I have to say that it's quite brilliant. 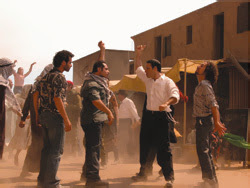 Just imagine "West Side Story" with Palestinians and Israelis instead of Jets and Sharks. You can read more about it here or download it from iTunes. What we have, friends, is a remarkably distinguished field of candidates vying in an election system that has become truly insane. Candidates are campaigning now, roughly a year before the primaries. The primaries will be over relatively early, and we'll probably know the major party nominees by next February or March. 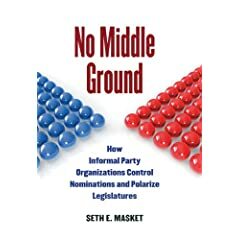 As Broder says, "[S]omeone is likely to put a death grip on each party's nomination before most Americans have begun to size up his or her capacity to be president." As a result of that earlier nomination, the general election campaign will be much longer: "[A] nine-month marathon that leaves contenders and voters exhausted." These assertions all manage to defeat each other. If candidates are campaigning now, running around the country, giving interviews and speeches, meeting voters, etc., then voters are in the process of sizing up their capacities to be president. Why is that process good when it happens in early 2008 but bad when it happens in 2007? I'm also unclear how shorter campaigns are better for anyone. So what if contenders are exhausted? I'm supposed to care that they're well rested for Thanksgiving in 2008? And I hardly see how a long campaign exhausts voters. We still only have to vote once. If we get bored by the campaign we can pay attention to something else for a while. Yes, a longer campaign will cost more, but that means that more money will be spent on advertisements and candidate travel - you know, things that inform voters about the candidates. Why is this bad? If you haven't heard this transcript of Lyndon Johnson ordering a pair of pants, you really ought to. Okay, thanks to my 5-year old son, I've now watched "Return of the Jedi" several times in the past year, and I've gotten angrier at it each time I've watched. Not for the usual Kevin Smith reasons, which are totally valid, but because the entire first third of the movie is completely ridiculous. Bear with me here. The first third of the movie is set on Tattooine. All of our heroes have returned to this planet to rescue Han Solo from Jaba the Hutt. Why every important person in the rebellion should be put at risk to save one pilot is debatable, but he's their friend, so whatever. But what exactly is their plan for saving Han? Keep in mind they've had several years to plot this one out. So when the movie opens, we find R2D2 and C3PO being handed over to Jabba, ostensibly as some kind of peace offering. As we'll find out later, Artoo has Luke's lightsaber hidden inside him. We also discover that Lando is already in place, posing as one of Jabba's guards. So now there are three of our heroes on the inside. Good so far. Then Leia enters in disguise bringing in Chewie, whom she sells to Jabba. Okay, so now we have five of our heroes in place, set to spring Han. All we're waiting for is Luke. But then Leia decides to try to thaw out Han and free him in the middle of the night. Huh? If that was the plan, why the elaborate ruse to get all the others inside Jabba's lair? And where was she going from there? Were she and Han going to sneak out and leave the others behind? This is stupid. But then she's caught anyway. Anyway, now Luke enters the picture. He appears calm and serious, appearing every bit the Jedi knight, except he enters completely unarmed. Then he tells Jabba to release Han. 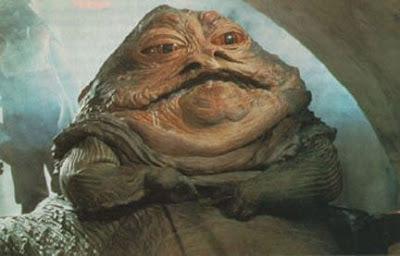 Jabba says no. Apparently, it never occurred to Luke that Jabba might say no. Luke then grabs someone else's laser pistol, but before he can actually aim it at someone, he falls through a trap door. This was the plan? Get all your friends in one place, one of whom is actually holding your lightsaber, and then just panic and try to grab a gun? And what kind of a Jedi doesn't pick up on the trap door? Why didn't Luke just enter Jabba's lair with his lightsaber and kill everyone in sight, including Jabba? That's what he ended up doing anyway. This pisses me off. Hopefully, the above song will help.